DALLAS (FWAA) – Arizona State's Angelo Richardson is the weekly nominee for the 2012 Discover Orange Bowl-FWAA Courage Award, to be announced at the end of the season. Richardson, a junior from Oakland, Calif., is enrolled in school six years after a shooting left him paralyzed from the waist down. After a spectacular junior-college career at Santa Rosa Junior College, Richardson signed a letter of intent to play for the Sun Devils in 2006. His arrival was highly anticipated. "He was one of those players who immediately jumped out at you," former Arizona State coach Dirk Koetter told the Oakland Tribune. "He could run by everybody. He had size, speed, toughness and elusiveness." But a few weeks later, early on March 4, 2006, Richardson was shot twice – once in the chest, and then in the back. His spinal cord was not penetrated, but it was damaged by what doctors called shock-wave destruction. Richardson was with friends in San Francisco and was not involved in the dispute that prompted the shooting. "You can't live in the what-if phase," Richardson told the Arizona Republic. "What if is not actually reality. This is who I am now, and I have to go forward and progress." The Sun Devils honored Richardson's scholarship, even though he was signed two coaching staffs ago. He is majoring in justice. He is a regular at practices and games, watching from his wheelchair. Richardson trained for the Tempe heat, doing workouts of as long as three miles in the wheelchair. "I can't commend this university enough, because in actuality they don't have to do what they're doing for me," Richardson told the Arizona Republic. "I never played one snap here. They stood by their word 100 percent. This new staff treats me as family. Everyone has welcomed me with open arms." Richardson, now 27, retains hope of walking again one day. He says he draws inspiration from his daughter, Angelia, who was born a few months after he was paralyzed. "He's a great example of incredible spirit and attitude," Arizona State coach Todd Graham told the Oakland Tribune. "... (He's) an example of how you respond to adversity. He's a big part of what we're doing." For the seventh straight year, the Football Writers Association of America and the Discover Orange Bowl will announce a weekly nominee each Wednesday during the season. A blue-ribbon panel will determine the winner from all of the nominees. 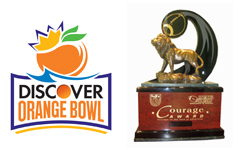 The winner of the Discover Orange Bowl-FWAA Courage Award will be announced in December and be presented with the trophy during the week of the 2013 Discover BCS National Championship Game. The Courage Award was created by ESPN The Magazine's senior writer Gene Wojciechowski, also an FWAA member. A select group of writers from the FWAA vote on the winner each year. The requirements for nomination include displaying courage on or off the field, including overcoming an injury or physical handicap, preventing a disaster or living through hardship. Previous winners of the FWAA's Courage Award are Michigan State offensive lineman Arthur Ray Jr. (2011), Rutgers defensive tackle Eric LeGrand (2010), the University of Connecticut football team (2009), Tulsa's Wilson Holloway (2008), Navy's Zerbin Singleton (2007), Clemson's Ray Ray McElrathbey (2006), the Tulane football team (2005), Memphis' Haracio Colen (2004), San Jose State's Neil Parry (2003) and Toledo's William Bratton (2002).